As with all breaks of the 20 day moving average, however brief, the S&P 500 has quickly rebounded now and sits right below it. Every other episode the past half year this level was quickly reclaimed and back to the ever present rally we returned to. As I continue to say, everyone will keep playing the pattern until it fails. Since failure only happens once – the odds are on your side. When that failure comes, that will be a true change in character and one can adjust – no reason to be a hero and “predict” things in advance. From here, the fragile bears still have a a few chances: (1) no break north of the 20 day moving average (2) stalling at some level below S&P 1080 potentially setting up a head and shoulders formation or (3) stalling right at S&P 1080 potentially setting up a double top formation. That is a lot of gobbley gook if you don’t bother with technical analysis but trust me, HAL9000 and his computers know what it means. 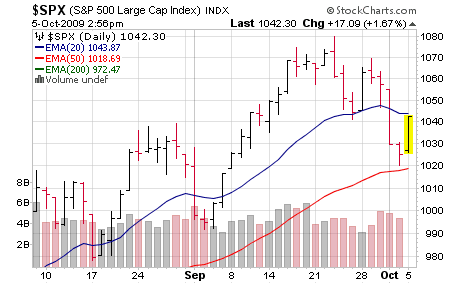 If Larry Summers still has the reigns S&P 1080 will be smashed and we’ll be off to the races again. So now we just sit back and observe. If we continue to rally I’ll start rehedging at higher levels and then “exit” some of the hedges (mentally “stopping” myself out) if S&P 1080 is smashed and the race to S&P 2500 by 2010 returns. Unemployed masses of Americans? That is so last week. Remember, the more people out of work – the less expenses for corporate America (better profits) … green shoots. p.s. on a halfway related note we’ve seen a lot of mainstream media attention to the farce that is the birth death model after the 824K (additional job losses) “oopsie” admitted by the Bureau of Labor Statistics last Friday… it is always good when the media figures things about a half decade after a few voices on the internets (sic) (Jan 27, 2008: Monthly Jobs Report & Birth Death Model). Why no one in media was questioning how our government was telling us (just throwing out one example) in any one month during the deepest recession of our lives that 100K jobs were being created by companies “too small to survey” is beyond me. Especially when some of those jobs were in hot sectors such as… uhh, construction. Garbage in, garbage out aka “you can’t handle the truth”.